It was shortly following my fortieth birthday that I began to notice that when I was reading, I was holding my book further and further away from my face; with each passing week. I could actually see the words blur as I brought my book closer to my face. It dawned on me that I had finally reached the stage in my life where I would be needing “reading” glasses. From what I understand, as we age, our cornea becomes less pliable and cloudy resulting in a less clear image. Our hardened lenses begin to focus on distant objects and closer objects become less clear. Another reason that so many of us lose our perfect vision is the result of the muscles around our eyes weakening and the skin loosening. This causes that “droopy” eyelid look and can also affect our vision. 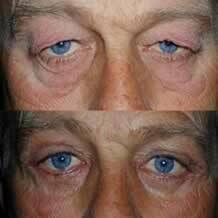 Having a blepharoplasty procedure may help to restore our peripheral vision. Blepharoplasty is a cosmetic eyelid surgery that may also help to restore some of our eyesight; particularly our peripheral vision. If you think about it logically, how can you possibly see clearly when your eyelids are drooping over your eyes? This surgery will not only give you a refreshed appearance and more youthful look, it has the added bonus of allowing us to see more clearly. It’s a win-win scenario! Hmmmm, maybe I will have to add that one to my list! After being floxed you want to have cosmetic procedure? After my FQ experience my scratches and cuts dont heal right ( leaving a purple scar). Either way wish you well. Yeah, I suppose that is true!I haven't had any issues with scarring, just no collagen and sagging skin everywhere! Save your money, there is no "fountian of youth " in a bottle yet. People will claim anything to get your $. Take a look at the website in the above post with the collagen supplement clinical data page. The clinical data page is incomplete with no useable data? These people arent even scientist? Trauma physician? Looks like 5th grade research. I have nothing against vitamin/supplements but u really think a collagen pill works and believe the clinical data provided? What is a 100% pure collagen complex? Pig Fat? They wont even tell u whats in it. Good luck to you Ari. Yeah Ari, I think that I agree with you! lol Thank goodness you are around to tell it like it is! Sometime I just HAVE to write a post, gotta' pay the bills somehow! We can use the money saved from not paying $31 plus processing, shipping/handling and create a wonderful salad with fresh veggies to feed a family for a couple of days. Maybe buy some fruit too. Thanks Michele!!!! Kind of funny how the data on cipro labels are very incomplete also but medical professionals are giving to patients like candy for tons of reasons. When is the last time the FDA showed us data on cipro usage and effects on health. It's funny how we will look up cipro side effects and believe the terrible things patients write about it and have a doom and gloom attitude but if many people post positive responses about a natural supplement they are very pessimistic about it and negative. Look at all the testimonials about collagen on different websites. I would much rather look at those and believe the body has mechanisms of healing in it with help from good supplements than to be negative and not even attempt to try safe alternatives to speed up the healing. I also make salads every night for my family by the way and maybe they are helping my joint pains also. Negative? Not at all. Money is tight. Collagen production is the fountian of youth. Natural Collagen production is the trillion dollar question. I dont believe the collagen pill you are pushing will work. Maybe it will help you. Reminds me of some male enhancement pill company with the money back guarantee. Does this supplement work? You havent said one way or another just buy and take it? You sound like a salesperson. Unfortunately it is much easier to hurt a body than to heal it and science doesnt have all the answers. Maybe Michele believes and will buy ten bottles. Ask her. Ari, the warnings for Cipro are not on the bottle. The warnings are on the package insert that the pharmacy or MD hands out to the patient. The piece of paper you might have tossed out w/o reading or didnt completely understand. The warnings are very complete but you need a magnifying glass to read them and a medical degree to understand all the body systems affected. But the warnings are there. Call and ask the FDA and they will sell you the data you require. They charge a fee for research. MD's prescribe the drugs for conditions/illness the FDA has approved. Most of the time they use the manufactures recommendations. I am not on there side. Its a stinky business but at this time it is what it is. ok, you guys, just wait and see what my blog assignment is going to be today! As far as collagen goes, it is my understanding that Cipro does a pretty darn good job of destroying it. I have also been told by a medical professional that Vitamin C can help to restore it. I am not a nutritionist but I do try to eat healthy, a mostly plant based diet, but not entirely, I try to limit my sugar intake and try to take supplements that have been recommended to me by some one that better understand how a body works. Exactly, my collagen (Im 47) is severely damaged. I've got lines on my face and forehead I see on 65 year olds. Cuts leave funny looking purple scars, and my skin doesnt glow if u know what I mean? I look nothing like the pics 2 years ago. My understanding is the tendonitis is directly related to collagen damage though I have no way to prove it. If someone can figure out the collagen puzzle then they can fix us. All of my supplements are pharmacy grade at this time and prescribed by MD or nutritionist. I tried OTC stuff and spent tons of money and still damaged. Thanks for the blog. First off sorry for your pain and suffering. Let us know if the supplement works. I spent hundreds the first year chasing a miracle and now I wished I would have saved it. I put money in peoples pockets who were taking advantage of my bad situtation. The EU has different rules than the FDA, dont know what your options are. Sorry and hope you are doing better. So, all of you anonymous people! I totally agree with the 47 year old that looks 65! I look in the morrir and wonder who that is looking back at me! As if being crippled isn't enough, walking like I am 90 plus and then aging 20 years overnight as if to say...gotcha' again! Warning, warning to all of those of you that have been and are going to be prescribed...like Ari said quinolones....to be taken in "specific life threatening conditions" when all others have failed! Someone else mentioned Genacol here, for hydrolyzed collagen. Cipro practically destroy my right (it affected all joints and tendons, but the longest lasting and most painful damage was done to my right ankle). Five months after taking Cipro, my right ankle was badly hobbled. Normal walking would cause severe pain. I'm a healthy 30 year old male that has never suffered any kind of joint or tendon pain, and the body-wide pain began days after taking Cipro, so it's clear that was the cause. Anyway. I tried the collagen from Genacol and within days it began reducing the pain in my right ankle. Cipro destroys the collagen that tendons are made up of. You have to essentially regrow all the damaged collagen, and to do that you have to go above and beyond normal dietary requirements for healthy tendons. Collagen in tendons naturally and constantly is destroyed and regrown. Cipro literally kills your collagen by depriving it of nutrients like magnesium. I can't suggest Genacol strongly enough if you're suffering from Cipro caused tendon problems. Go easy on your tendons, and take at least 30 days of Genacol to see whether it works for you. The odds are you'll see vast relief in the first month. It takes up to 90 days for new collagen to convert into type 1 collagen that forms 90% of your tendons, so give it some time. If it's going to work however, you'll probably see results in the first week or two. It's worth the $30 at Amazon to find out. New Windows, New Siding, New House!! An Orthodontist is in Our Future! Integrated Medical Data; What a Great Service!